Now that you've gotten the scoop one what to expect when you go green with your skin and makeup products, it's time to focus in on the last part of our natural-beauty series: your hair. People either really love with a capital L their organic and natural coiff care, or they avoid it like the plague. According to hairstylist Mauricio Cifuentes — a.k.a. the Organic Hair Doctor — you've got a lot to gain by considering the green route. "One of the biggest benefits of switching to chemical-free products is that you will notice a big difference in your scalp — it won't be as dry or sting," he says. He also notes that instead of drying out the hair (which he says many conventional shampoos, treatments, and stylers do) all-natural, sulfate-free, and paraben-free products actually hydrate the hair more. And, if you have damaged hair, Cifuentes says it will heal much faster. Read on for more of the 411 on going green with your mane. For all the good that natural hair products do, there are a few things to note. For one, most natural and organic shampoos do not produce a lather, or have a very sparse one. That's because they don't have sulfates, the main lathering agent in most conventional hair cleansers. According to Cifuentes, sulfates strip the natural oils of the hair, which contributes to that dried-out feeling he mentioned earlier. For some people, who associate a good, clean feeling with a healthy amount of suds, this can take some getting used to. Cifuentes also says that it will take time for your hair to get the best results and for it to acclimate to using non-chemical products — he says that it usually takes about four uses before you see the optimal results. In order to get the best results, he also suggests "de-mineralizing" your hair before you make the natural switch. "When my clients come to the salon, I de-mineralize their hair with a clarifying treatment to take out all the minerals and synthetics that have built up on the hair follicle." He suggests you use a clarifying shampoo for a week at home before using your natural products, in order to see the best results and shorten the acclimation period. As far as choosing your products, once again, it's all about the research. "Research companies that develop green practices, companies that are active in their community, and companies that associate themselves with ecological practices," says hairstylist Kevin Murphy. "I don’t think you choose green like you choose a lipstick color. You choose these types of products because your health is important to you, the health of your family is important to you, as is the health of your environment. We choose these practices because we care about the future of the planet and the legacy we leave behind for the next generation." 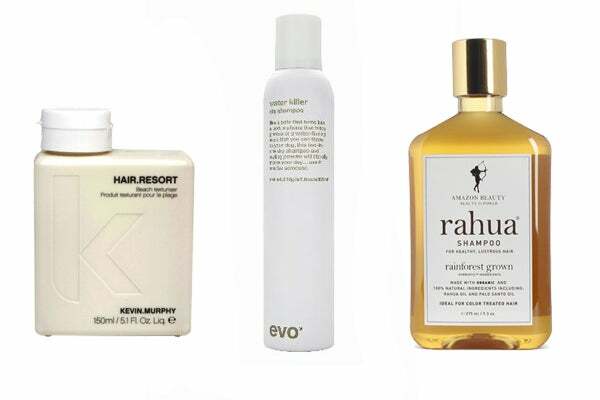 Kevin Murphy Hair Resort Beach Hair Texturizer, $32.48, available at Verbena Products; Evo Water Killer Dry Shampoo, $22.39, available at Amazon; Rahua Shampoo, $32, available at Rahua.